So, I promised you a concert review, yes? Last night, Darrell and I attended the Panic! (yes I still put that exclamation point in there) at the Disco at the 20th Century Theatre in Oakley. It was the first time either of us had ever been to that venue, but even knowing it’s one of the smaller venues in the city, we were shocked at how intimate the setting was. Perfect for a concert, if you ask me. Right, concert … back to the story. In 2006, back when no idea was a bad idea and distance was measured in CDs required rather than hours on the road, my good friend Lauren and another friend Travis hopped in the car and drove more than five hours from Muncie, Ind. to Grand Rapids, Mich. to see Panic! at the Disco for the first time. 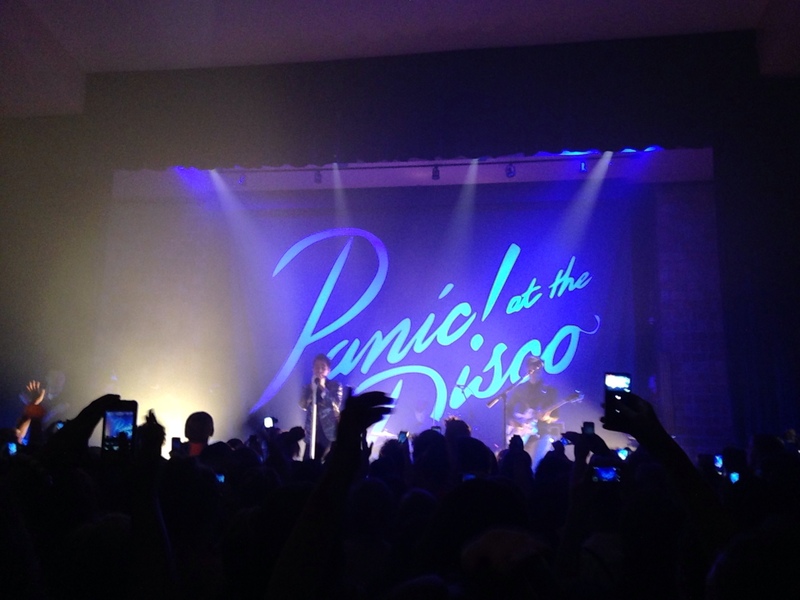 The venue was terrible: in what was essentially a very large pole barn we watched Panic’s first headlining tour unfold, complete with half dressed dancers and elaborate sets. We got our first introduction to another great duo, The Dresden Dolls, who opened for the show (unfortunately, they’re no longer performing, but if you get a chance you should probably check out Coin Operated Boy). Anyway, Panic. Last night’s show could not have been more different than their performance 7 years ago. This time, the smaller stage invited their individual personalities to shine rather than blur into the highly choreographed movements of dozens of actors and dancers. And while everyone loves the glitz and glamour, there’s something infinitely more charming and relatable about a lead singer struggling through sound issues by cracking jokes in the microphone. Small venue wins over large arena in my book, every time. Panic! made a great show by being human. Their attitude on stage made you feel like you were part of some inside joke; their presence made you feel undoubtedly welcome. Of course, the music was fantastic; they played the best of their three existing albums and two from their yet-to-be-released album, “Too weird to live, too rare to die!” I knew exactly which song would be a part of their encore, although I had forgotten their tendency to cover a female artist song. Can I call it a tendency if I only know it’s happened at two tours? Regardless, this time around it was Titanium … completely unexpected yet impeccably covered. As far as the new album, I know I’ve pre-ordered my copy. Of course, I already own the other three (A Fever You Can’t Sweat Out, Pretty. Odd., and Vices and Virtues), so it only made sense to complete the set. Again, they’re awesome, so a pre-order gets you two early downloads. Should I stop bragging about these guys yet? Anyway, to the guys of Panic! : thank you for putting on such a great show. I was quickly able to forget the fact that as an early stage fan, I was unfortunately one of the oldest members of the audience. Pretty sure some most of the girls that were there are younger than I was at my first Panic! show, but it doesn’t matter. You still rock, and I’m still loving it.